For the video instructions on this project and the other pdf pattern's that come with the video, go to our video section on this site (click here). 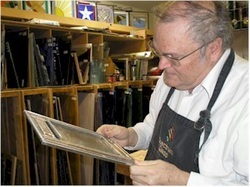 To purchase frames, visit our Etsy Store (click here). 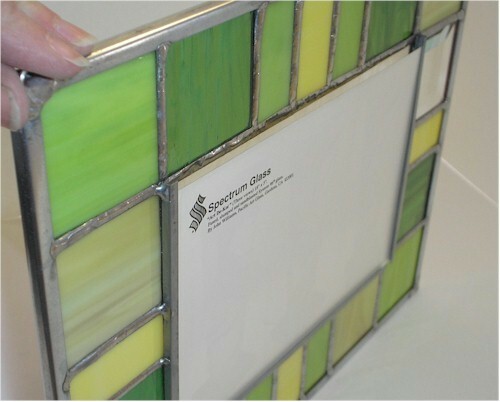 To create a stained glass picture frame, you need to create a design which has a border around a piece of clear glass where the picture can be seen. 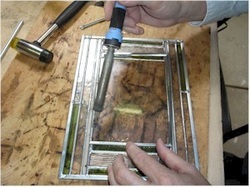 We are working with a 5 x 7 glass in this frame. (You can find a pdf of a frame design you can print out by clicking here) print both pages out, tape them together and then you can modify the design to suit your needs. 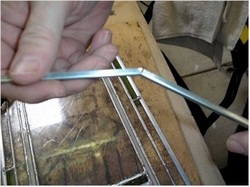 Use sharp diagonal pliers (dykes/lead nippers) to clip the top and bottom of a piece of 1/8" zinc u channel. 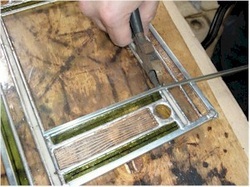 After clipping the top and bottom of the zinc, bend it backwards to break those pieces. Then fold the zinc into an "L" shape. You do NOT have to form a continuous piece, I do this just to speed things up. 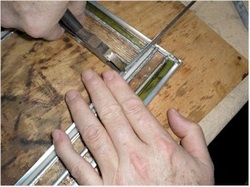 But you can cut three different pieces of channel. 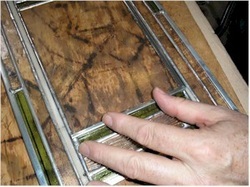 Cut them a little short so it's easy to slide the backing cardboard and the picture into the framework. 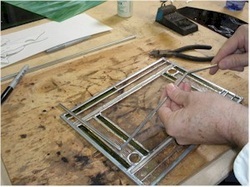 Next, place the "L" piece onto the frame to align the zinc with the picture frame. When we soldered the back of the picture frame, we left the solder lines on this edge rather flat so the zinc would sit close to the glass. Again, Clip top and bottom of the zinc. Bend it backwards once, like before. Now, you'll have a "U" shape that will fit on the back of the picture frame. Clip the zinc so it's the right height and bend it back and forth till the metal weakens and the extra separates from the "U". You may need to gently tap the corners so they are square. 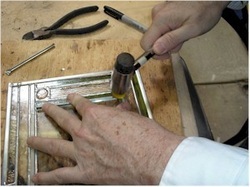 Over tapping can bend the metal so that it is difficult to get the backing cardboard and picture into the frame. 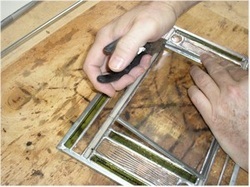 Solder the zinc strip to the back of the window. 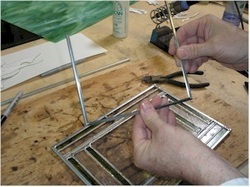 You don't have to solder it at every point, top and bottom of each side and middle on long pieces. Next add rings to hang the frame and clean and polish it. I think I need to polish this one a little better before giving it as a wedding gift. 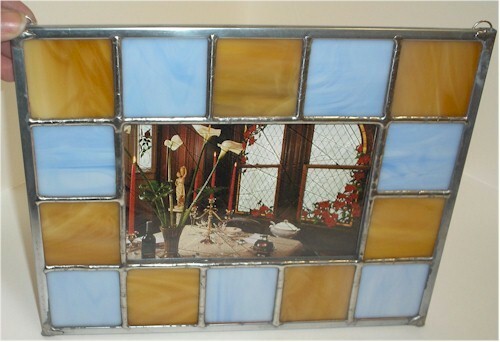 Here are two different frames, the first shows the front side of a frame with a post card in place. The second shows the back of the frame with a post card inserted.